I am continuing this week’s rose theme with a review of yet another rose fragrance from Andy Tauer. Following Andy’s Master Class on Roses, I discussed the divinely edible Une Rose Vermeille, now it’s time for me to focus on the wonderfully retro Une Rose Chyprée. Une Rose Chyprée is like no other modern perfume, it is a fragrant time capsule which transports you back to a sepia-toned past, when perfume was bold and perfumers didn’t shy away from deep, rich mossy notes with a masculine edge. Andy Tauer describes Une Rose Chyprée as a “modern vintage perfume”  and that is exactly what he delivers, a throwback rose chypre with a modern twist. 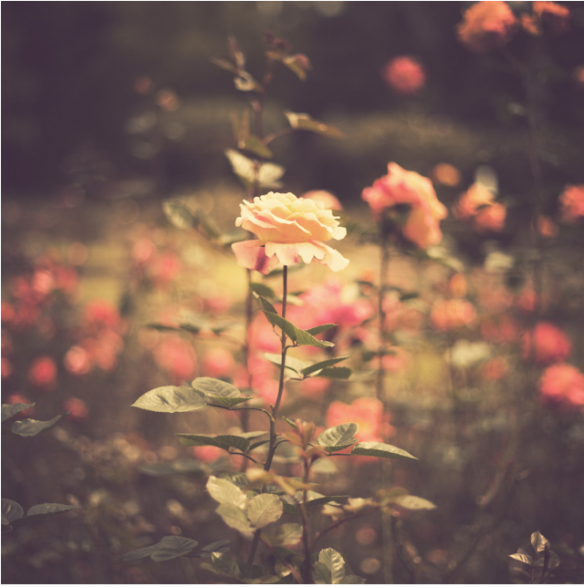 In a world of faux-chypres, where anything with a bit of rose and a touch of patchouli is considered a chypre, it is a refreshing feeling when you first spray Une Rose Chyprée and are greeted with that rare thing – a true chypre. But Une Rose Chyprée isn’t simply a rehash of the old school chypre, not at all, remember this is Andy Tauer and as to be expected he has given the chypre a ‘Tauer twist’. Une Rose Chyprée opens with zesty citrus, there is lemon and bergamot but also a nice touch of spicy, orangey clementines. The rose is present right from the beginning, it is warm, spicy, slightly fruity and dusty but it isn’t overly dominant within the composition. What I really enjoy about the rose is that it casts the fragrance in autumnal hues, it doesn’t quite feel like a red, white or pink rose, it is best described as an auburn rose, if ever such a thing existed. The rose becomes richer as the fragrance progresses and its spicier, clove-like facets become more pronounced. Cinnamon is added to bring out the spiciness of the rose and it is at this point that Une Rose Chyprée really smells like a Tauer fragrance. The spices within the heart pushes Une Rose Chyprée into Tauer’s familiar oriental territory, but after a short while the weight of the base notes brings it back round in to a chypre structure. It is fair to say that the ‘Chyprée’ part of Une Rose Chyprée dominates and the base is chock full of patchouli, moss, amber and a good amount of tobacco. Vetiver adds a green herbal quality that amplifies the mossy notes within the base but unlike chypres of times past, the mossy part, whilst being distinct, is not allowed to take over. Finally, vanilla softens the richer notes and rounds off what can only be described as an extremely well-put-together composition. Une Rose Chyprée is the first modern chypre I have smelled that fulfils the chypre brief, and lives up to the legacy left by fragrances such as Mitsouko, but it is disntictly Taueresque in its nature. If you are a fan of old school chypres or of Tauer Perfumes then Une Rose Chyprée is not to be missed, it doesn’t just offer a chance to reminisce on perfumery’s past, it also offers an exciting insight into the future and what a talented perfumer with a distinct vision and a huge respect for the art of perfumery can achieve. 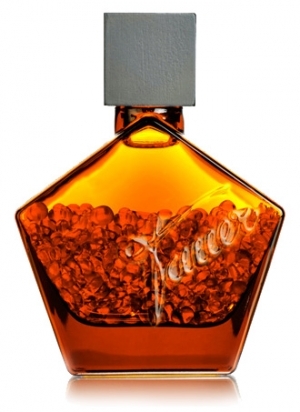 Une Rose Chyprée, and the other fragrances within the ‘Homages’ line are housed in Tauer’s signature pentagonal flacon, however rather than the usual cobalt blue, the glass is a rich, burned amber in colour. A cube lid made of wood adds a nice finishing touch. The flacon is filled with glass beads, again in burned amber and they add a lovely, fluid effect and sound when the flacon is moved. The flacon is 50ml in size but due to the glass beads it holds 30ml of perfume. Une Rose Chyprée is part of Andy Tauer’s ‘Homages’ line and is available in 30ml Eau de Parfum for £99. This review is based on a sample of Une Rose Chyprée from my own personal collection. Posted in Chypre, Floral, Perfume Reviews, Tauer Perfumes and tagged Floral Chypre, Rose, Tauer Perfumes, Une Rose Chyprée. Bookmark the permalink. Love that bottle and those glass beads! The rose chypre base of this one is absolutely drop-dead gorgeous and totally “me”, but I just couldn’t get past the cinnamon. I often have issues with this note, but I find it jarring here. It’s been a while since I tried it though and I still have some of my sample left so I’ll give it another go. Like you say, it’s great that in this day and age despite all the restrictions, Andy is able to give us an authentic smelling chypre base. I did also catch up with your lovely, detailed post about the Masterclass, so many thanks for that. It’s a shame that cinnamon ruins it for you, weirdly, I’m not a fan of cinnamon in food but I do like it in perfume and especially in Une Rose Chyprée. Do let me know if your mind changes when you try it again. I like your point in regards to restrictions, as you say despite the restrictions Andy is able to give us an authentic smelling chypre and it just makes me ask the question – ‘what is everyone else’s excuse’? Big perfume houses seem to shy away from chypres, and if it’s still possible to make a decent one, despite the restrictions, I wonder why nobody is? That’s a shame, but I agree that the Tauerade can be quite intense, which isn’t good if you’re not keen on it! What did you think of the Pentachords? They are very un-Tauer. They are worth trying, even if they’re not your thing (which, when smelling them I can see why) simply because they are so unusual! This is a lot more chypre than rose on me, but that is why I love it. A grand perfume. Beautiful review! It is most certainly a grand perfume and I agree the chypre part is definitely more dominant than the rose and that’s what makes it sooooo good! I have tried Miriam, but only very briefly, there did seem to be a lot of rose and a lot of violet too. I liked what I smelled! Oh dear, you should contact Luckyscent, they’re usually a lot quicker than that! Me too! Have you tried Orange Star? I’m falling in love with it and it certainly has some serious Tauerade going on! Sampled this last night for the first time, very briefly mind. Will give it a full wearing soon. I’m not sure what to make of it, I’m a huge Tauer fan as you know but, similar to in Eau d’Epices, there was a savoury herbal note that I think was the bay mixed with cinnamon, it spoilt it for me. I haven’t waited for this to pass though yet so will have to do so. I really want to enjoy this!! I completely get you, there is definitely a herbal quality to Une Rose Chyprée that is also present in Eau d’Epices. Persist with URC, the dry down is worth it!